Mia Wasikowska and Glenn Close walk out together. Unbeknownst to the staff at the Dublin hotel where he works, the professional, quiet waiter Mr. Nobbs is, in fact, a woman. 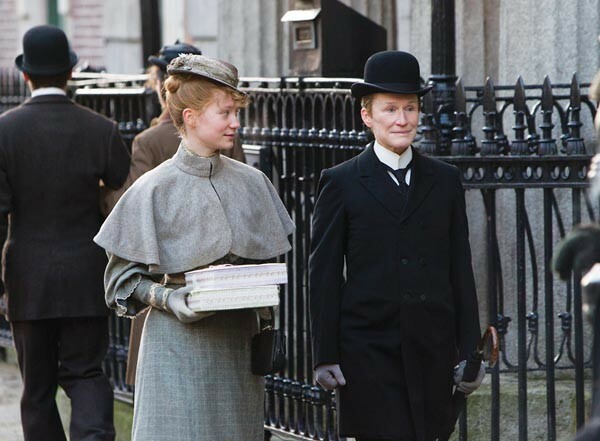 In order to work in 19th-century Ireland, Albert Nobbs (Glenn Close) has lived in disguise and solitude for more than 30 years. Rodrigo Garcia's drama Albert Nobbs depicts a few months in Nobbs' life, as he plans for a life beyond the walls of the hotel. A chance encounter with a housepainter suggests Nobbs might have a chance at companionship, and after years of saving, Nobbs is ready to open a tobacco shop. But a relationship between a young hotel maid (Mia Wasikowska) and a new handyman (Aaron Johnson) threatens to complicate Nobbs' plans, and perhaps even expose his secret. Adapted from a George Moore short story, Nobbs is an illuminating portrait: Nobbs' tragedy of being a woman trapped in a self-crushing lie is also the circumstance that gives her the power to survive, and perhaps even find fulfillment. The ethereal, feminine Close — perhaps through force of sheer will — effects a remarkable transformation into Nobbs. (When Nobbs once dons a dress, Close conveys how awkward and exhilarating this "forbidden" act is.) While Close's understated and heartbreaking performance dominates the film, she is buttressed by a fine supporting cast that includes Janet McTeer, Brendan Gleeson, Jonathan Rhys Meyers and Brenda Fricker. Albert Nobbs is not showing in any theaters in the area.